– Find a way to make the GMO bacteria non-resistant to antibiotics (kanamycin). This would make easier for our prototype to be approved by the authorities however the detection might be less efficient. – Find a way to manipulate the bacteria without exposing them to the environment. This week, we met Prof. van der Meer and Dr. Leuenberger and spoke about the issue of taking GMOs into the field. In Switzerland where certain laws have to be respected.Our first issue was the antibacterial resistance to kanamycin, after discussion we found out that the bacteria could be made without this resistance i.e making it safer. 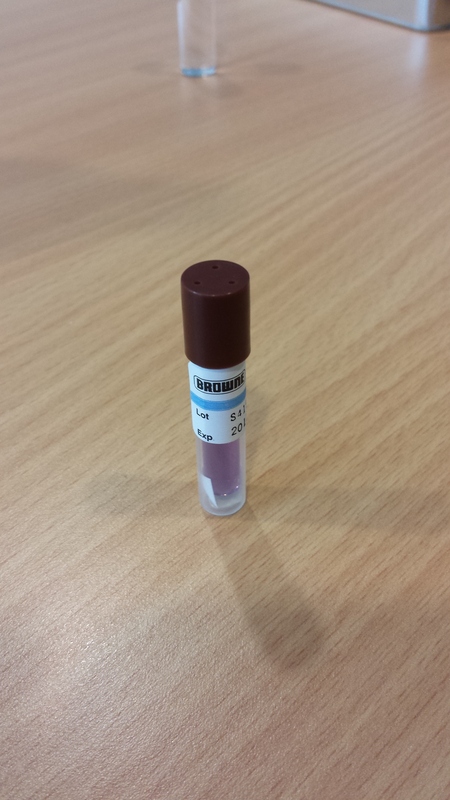 Then switching to the issue of containment, Dr. Leuenberger proposed the idea of a browne vial which basically works like a glow stick ; two separate contents mix after strongly bending the vial. We are going to investigate on finding a vial more suitable for our project. Also Pr. van der Meer told us about a company based in Germany called ARSOlux where another kind of contained vial is used: a syringe can introduce water into the vial without exposing its content to the environment. The problem with the syringe is that it creates waste which is a problem as it was in contact with GMOs. Our goal will be to take advantage of these already known vials to adapt them to our project. Next step is to have the prototype approved by the Swiss authorities i.e permission to take GMOs into the field. To do so we will organize a trip to Bern. Indeed, the law should be a design criteria and therefore should be taken into account in the earlier steps of prototype design. Also, we will soon schedule a lab session at Prof. van der Meer’s lab to get a hands-on experience with arsenic reporter testing.